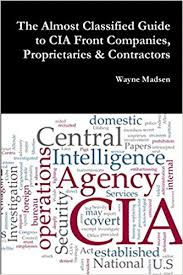 For those of us who dabble in spy-hunting, Wayne Madsen has provided 400 pages of companies that he suggests are CIA fronts. The full title is “The Almost Classified Guide to CIA Front Companies, Proprietaries & Contractors”. Many of these are well known, but there are hundreds I have never heard of. Additionally, there are scores of outfits like Exxon Mobile that he categorizes as “CIA partner”, extending the field into the very core of American capitalism. I believe this book is a good place to begin examining a particular company, but I should extend this caution; I looked at his reference for “Evergreen International Airlines”, a defunct company that I am very familiar with. I researched and wrote for years about Evergreen, which took over most of the CIA’s propriety airlines after the revelations of The Church Committee hearings. Madsen includes Evergreen Supertanker Services in his summary of Evergreen’s operation, which is incorrect. The supertanker shipping lines operate out of Asia and are not part of Evergreen Aviation business in any way. Hopefully this is one of the rare mistakes in this otherwise very useful book. Madsen missed another name related to Evergreen Aviation that would have fit very nicely in this book; that is “Congress Financial”. Congress Financial was confirmed to me by two sources to be a funding mechanism for CIA fronts, and provided money to keep Evergreen out of one of their many runs at bankruptcy. I think this book can be very useful, but once on the trail watch the footprints carefully. This entry was posted on March 7, 2018 at 4:36 pm and is filed under Book review. You can follow any responses to this entry through the RSS 2.0 feed.